A beautiful, step-by-step guide for bringing movement-based meditation into your yoga practice and your life. 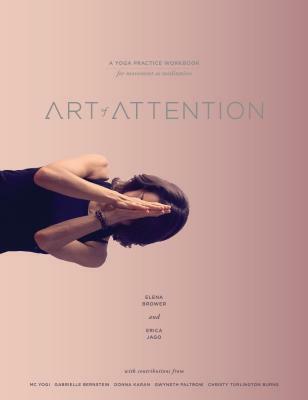 Distilled from Elena Brower and Erica Jago's acclaimed workshops and training programs, Art of Attention has become an essential resource among instructors and students seeking to bring movement-based mindfulness into their practice. This beautiful illustrated book guides you through pose-by-pose practices, journaling, and luminary wisdom into the deeper experiences of yoga practice. For students and teachers at every level, this one-of-a-kind resource takes us further into yoga--and the art of living--with clarity, creativity, wonder, and depth. Includes contributions from MC YOGI, Gabrielle Bernstein, Donna Karan, Gwyneth Paltrow, Christy Turlington Burns, and others inspired by Elena and Erica's work. "The wondrous images accompanying this invitation to practice set this book apart, conveying the beauty and adventure of contemporary yoga practice." "I've been inspired by Elena's commitment to bring us closer to our bodies and hearts, and this book accomplishes her objective beautifully. Art of Attention is an instructive, healing homage to the practice of yoga." "Every once in a while a book arrives in this world that contains magic so profound it will transform you forever, it will wake you up, turn up the light on your soul, and provide an oasis of healing, rejuvenation, and restoration for you to return to over and over again. Art of Attention is such a book. It will carry you gently into a deep yoga practice, while enlivening your mind, opening your heart, and soothing your soul." "The beauty, wisdom, and guidance in Art of Attention will not only strengthen your yoga practice, it will lead you to a deeper knowing and acceptance of yourself." "Elena and Erica have taken us on a journey, an initiation, a soulful exploration of the embodiment of divine movement through yoga. This book is a beautiful expression of their attention to luminous detail and sacred practice, and now it is a gift for all of us. Thank you goddesses "
"Full of inspiration, creativity, and awareness, Art of Attention will sensitize and energize your cells from the inside out, and jolt you into finding new expressions and discoveries in your practice and your life." "Can a book be a sanctuary? With Art of Attention, Erica and Elena have manifested an interactive portal to somatic consciousness, inner beauty, and self-reckoning. It stirs the heart, mind, and body to actively introvert and attend to the deepest layers of being." Elena BrowerElena Brower is a mama, an author, a teacher, and an artist. Devoted to cultivating meditation as your most healing habit, she's created books and programs with Sounds True. Her yoga workbook Art of Attention has now been translated into six languages, and Practice You, her journal, is beloved globally. She's developed two audio programs with Sounds True, The Return Home and Grounded and Free.Erica JagoERICA JAGO is a yoga teacher, designer, and artist who combines her many gifts to bring beauty, depth, and meaning to yoga books, media, and her classes. For more, visit jagoyoga.com.